The President of the French association of mayors is still continuing speaking - President Hollande is expected to take the stage afterwards. 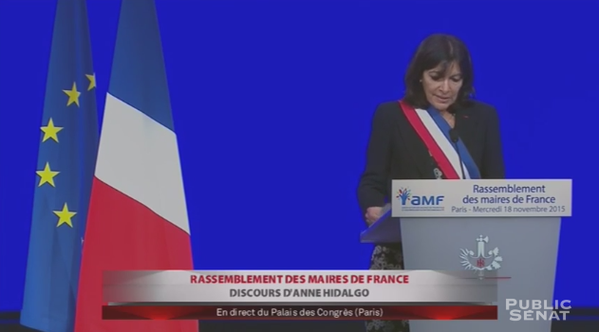 Anne Hidalgo finished her powerful speech by saying: "Long live Paris and long live Saint-Denis!" Meanwhile, the tense security situation in France continues. The Christmas lights turning-on ceremony planned for the Champs Elysees tonight is the latest to be cancelled. 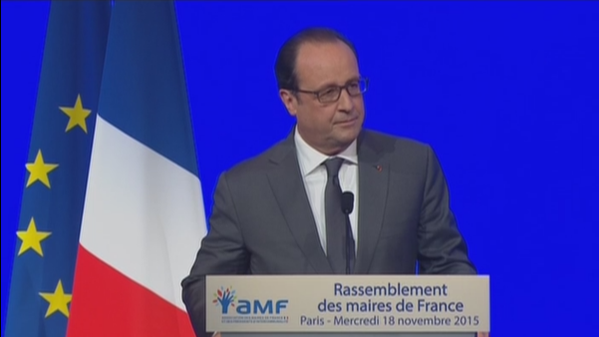 Francois Hollande is now speaking at the mayors' conference. He calls Paris a "martyr city but a city of light", adding: "We are on your side". "The aim was to neutralise terrorists who have links to the perpetrators of the hideous crime in Paris on Friday night," President Hollande says of this morning's operation in Saint-Denis. He praises all the police and soldiers involved, as well as the mayor of Saint-Denis, who also saw tragedy on Friday with the attack on the Stade de France, which is in the town. President Hollande says police "underestimated the violence they would be met with" but "fought them to the end of their mission". The French President repeats that France is "at war" with terrorism. He says Isis has an army, financial sources, oil, territory and accomplices in Europe and France with young radicalised Islamists. "It has committed massacres there and it has committed murders here," he says. He says the attacks have hit Paris and Saint-Denis but "the whole of France has been attacked because of what it represents, the values it holds...for what we are." The terrorists' aim was to target the idea of France itself...the liberty it defends." He says the youth of France was targeted irrespective of nationality, race or religion. He says the anger and emotion is "immense" with compassion towards the victims but also the "demand for action to bring the attackers to justice". President Hollande is talking about France's ongoing intervention against Isis in Iraq and Syria, saying an aircraft carrier is on its way to take more planes to the region. He is meeting Vladimir Putin and Barack Obama next week to co-ordinate their strategies. Talking of the possible extension of France's state of emergency, Hollande says the "temporary" restriction on some freedoms aims to ensure France's liberty in the future. Measures include increased powers of house arrest, surveillance and border control. "This war started years ago and we still need time to win," President Hollande says. Le Monde reports that the raid on a church in Saint-Denis earlier was a false alarm. Police have left empty-handed, watched by hundreds of photographers and journalists from around the world. President Hollande is now speaking about the refugee crisis, saying that people should show solidarity with asylum seekers and not turn away from them because of the Paris attacks. "We are all French and proud to be French," President Hollande says. "France will remain a country of freedom, of movement, of culture - an active, bold, dynamic country that does not give into fear. "Life must start again fully." He talks of France's gastronomic culture and bars and restaurants, music and sporting events and village fairs. France must remain itself. Our duty is to carry on with life"
"Long live the Republic and long live France," the President concludes. 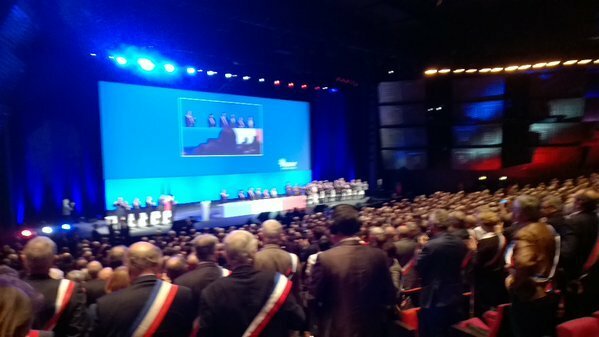 Thousand of mayors all wearing sashes in the colours of the French flags are giving a standing ovation. They go on to sing the national anthem. So a positive message there from President Francois Hollande, saying that although France still mourns, life must still be lived to its fullest to show terrorists that they have not succeeded in taking France's liberty or crushing its spirit. It echoes the mood of a lot of French social media in the last couple of days, where people have been sharing photos of themselves at bars, bistros and restaurants like the ones targeted on Friday night. A terminal of Copenhagen Airport has been evacuated due to a terror alert reportedly sparked by a suspicious bag, Adam Withnall writes. Terminal 3 and the airport’s metro station were closed off, while flights were moved to other terminals. 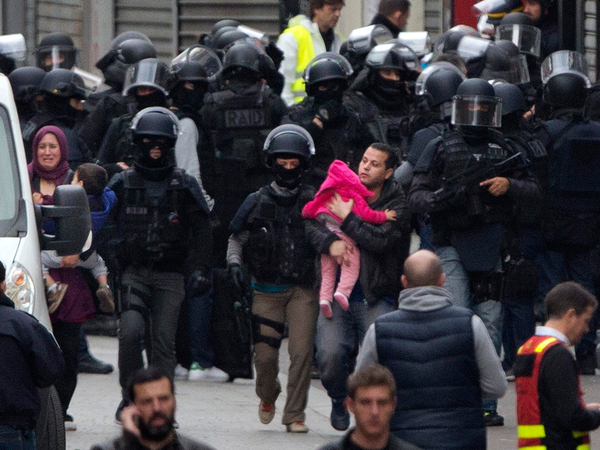 Police cordons have reportedly been relaxed in Saint-Denis and residents are moving around again. A lot of police still remain in the area but operations seem to be largely over. There is still no confirmation that Abdelhamid Abaaoud, the suspected mastermind of the Paris attacks, was killed in the operation. Intelligence suggested that he was in the apartment, which is a sensational development following assumptions that he was with Isis in Syria. Isis supporters have released another video on the Paris attacks in French. 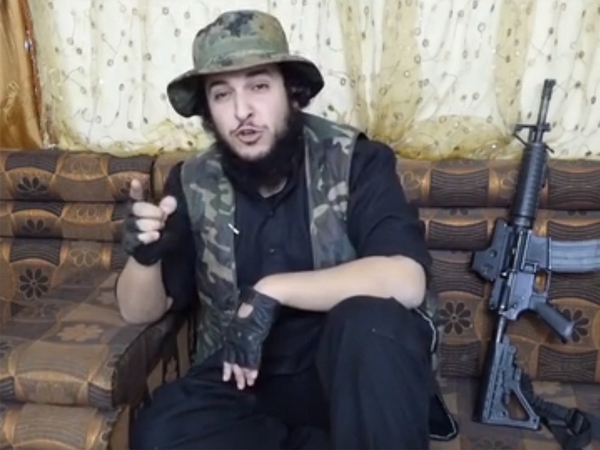 Three French-speaking militants sing and speak over footage of Friday's attacks before threatening further violence. It says the attacks were carried out "in revenge for the suffering of Muslims at French hands". The IndependentPolice in Paris had solid intelligence suggesting the "mastermind" of Friday night's shootings was hiding out in a flat in Saint-Dernis, the city's prosecutor has said. Francois Molins told a press conference after the siege in northern Paris ended that he could not confirm whether or not Abdelhamid Abaaoud was indeed found inside the apartment. He said information from tapped telephone conversations, surveillance and witness accounts led police to raid the apartment, during which seven people were arrested and two suspects killed. 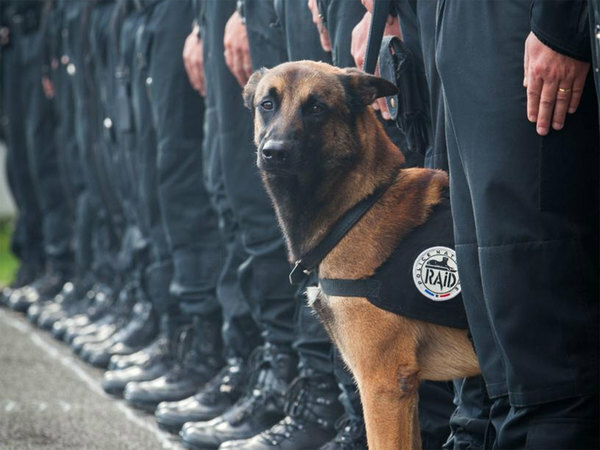 The hashtag #JeSuisChien is trending on Twitter in France following news of the death of police dog Diesel, who was shot dead by terror suspects during this morning's police operation in Saint-Denis. Le Monde reports that searches allowed under the current state of emergency are happening at an air hub in Roissy. The IndependentThe Isis militant group has released a new video in the French language, celebrating the Paris attacks and threatening more violence to come. The footage, released by the Isis-affiliated Furat media arm, shows two French-speaking militants asked how they feel about the attacks that “killed more than 100 people”. 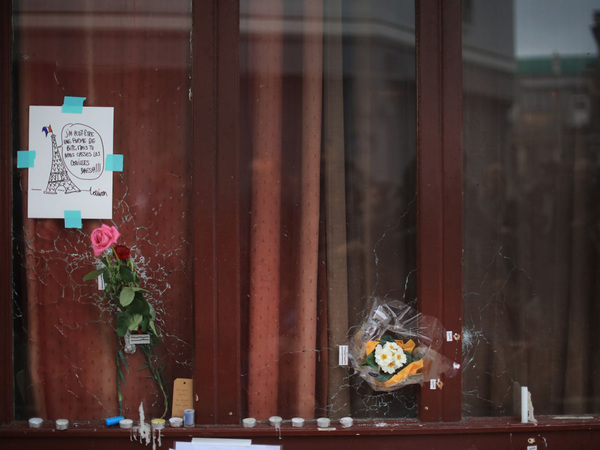 It shows footage and pictures of the aftermath of the shootings which have been widely available via the media, including video of a police shoot-out with the attackers and images of the bloody scene at the Bataclan theatre. Some more from the French President earlier. Mr Hollande said any places where people are "glorifying" terrorism will be shut down. A bill to extend France's state of emergency for three months includes a measure that enables authorities to close "any association or gathering" - which notably includes mosques and community groups - that would encourage people to carry out terrorist acts. The bill is to be debated by both houses of parliament on Thursday and Friday and is expected to be voted on by the end of the week. The IndependentThe death of a police dog during an operation to “neutralise” terror suspects near Paris has sparked a viral Twitter trend. 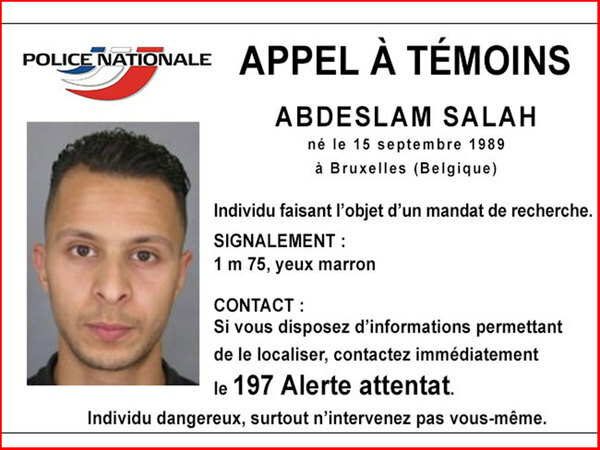 Spanish authorities have been alerted to look for Salah Abdeslam, possibly in a Citroen Xsara car. French authorities have sent out the bulletin to police across Europe asking them to remain vigilant for the fugitive. It was sent by Spanish authorities to border control police in the north-eastern Catalonia region next to France. Turkish have detained eight people at Istanbul's main airport who they suspect could be Isis militants planning to make their way to Germany, posing as refugees. The Anadolu Agency reports that they arrived from Casablanca, Morocco, and were interviewed at Ataturk Airport. One of the suspects allegedly had a hand-drawn picture of a planned route from Turkey to Germany, via Greece, Serbia and Hungary. Anadolu said the eight claimed to be tourists visiting Istanbul but a hotel said they did not have the reservations they claimed. The IndependentFrench authorities today announced that all of the 129 people killed in Friday's terrorist attacks in Paris have been identified. In a statement, released after Wednesday's government cabinet meeting, authorities said around 100 families have come to see and identify the bodies of their loved ones who were killed in the attack. 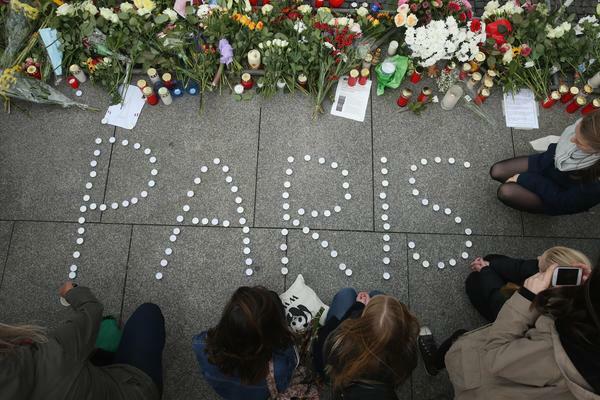 A backlash against Muslims has been reported across Europe in the wake of the Paris attacks. Chris Hemmings has written about his conversation with one Muslim taxi driver in London who feels his community is being alienated by the current debate around Islam. What am I supposed to tell my son? He's only ten. Every time I turn the news on, people are talking about Islam, about Muslims, about the religion I'm bringing him up to love. The IndependentSalah Abdeslam, a Paris attacks suspect who has been on the run since Friday, could be fleeing through Europe in a Citroen Xsara. French authorities have released a new alert to forces across the continent asking them to remain vigilant for the car, registration AE-113-SY, which may be carrying the fugitive. Earlier reports by Reuters that the terror cell targeted in Saint-Denis was planning further attacks in Paris' La Defense business district have been corroborated by another police source speaking to RTL radio. Authorities have not publicly confirmed the claims. 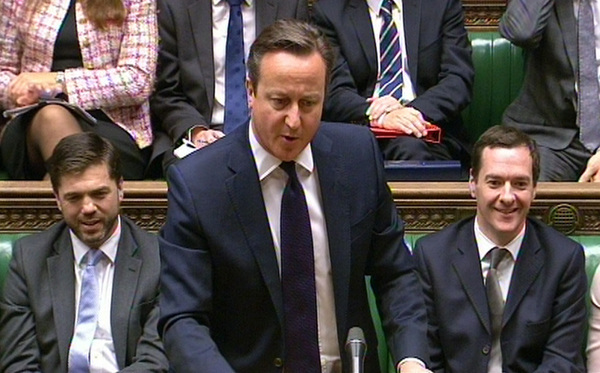 The IndependentDavid Cameron has said he is willing to launch air strikes against Isis in Syria without the backing of the United Nation’s Security Council. He said a UN mandate was “always preferable” but insisted the UK could not "outsource to Russian veto the decisions that we need to keep our country safe". He said he was also prepared to defy public opinion to bomb targets in Syria. One of the Royal Navy's most advanced warships will support a French aircraft carrier as it deploys to the Gulf to fight Isis. Defense Secretary Michael Fallon says the HMS Defender will provide cover for France's Charles de Gaulle carrier, which has left Toulon to help French operations. The ship, with 230 crew, is on a nine-month deployment to the Middle East. The Royal Navy says it can defend a group of ships against attack from the air, either by aircraft or missiles. In the latest issue of its Dabiq propaganda magazine, Isis has claimed to reveal how it brought down a Russian passenger plane over the Sinai peninsula just over a fortnight ago. Photos show what appears to be a home-made bomb that was planted on Metrojet flight 9268. 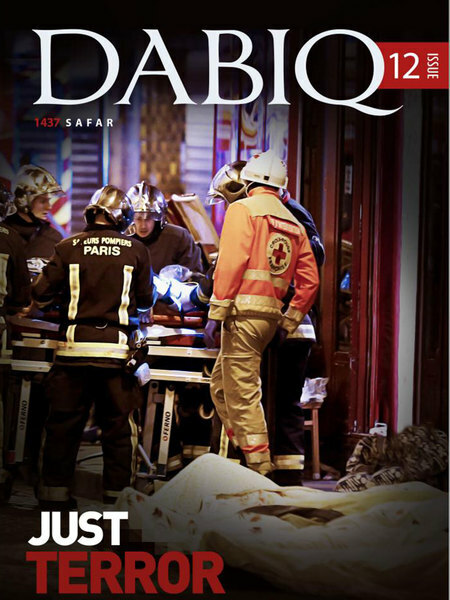 The magazine leads on the Paris attacks, in which it claims "eight knights brought Paris down on its knees, after years of French conceit in in the face of Islam". Isis' magazine also claimed it had killed Norwegian and Chinese captives after earlier demanding ransoms for the two men. Dabiq included two images of the men, saying they had been "executed after being abandoned by kafir nations and organizations." In the images, they appeared to have both been shot dead. The group had earlier identified the Norwegian man as Ole Johan Grimsgaard-Ofstad, 48, from Oslo, and the Chinese man as Fan Jinghui, 50, a freelance consultant from Beijing. The Chinese and Norwegian governments have not confirmed the claims.